This is a newly published eighty-eight page 9x12 inch photo history book of the community of Haleiwa on the North Shore of the island of Oahu, Hawaii. 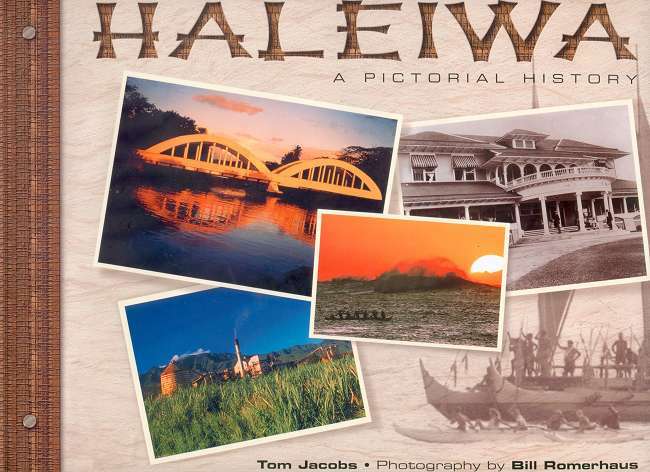 It features nearly 200 color and black and white photos and text covering over a century of history of Haleiwa Town and the surrounding area. Written by Tom Jacobs with photography by Bill Romerhaus and the North Shore Photo collection, it features well known landmarks, surfing, scenics, waves, and historic buildings such as the Haleiwa Hotel. Many of the photos you see in the 'Favorites' section on this website are in the book. 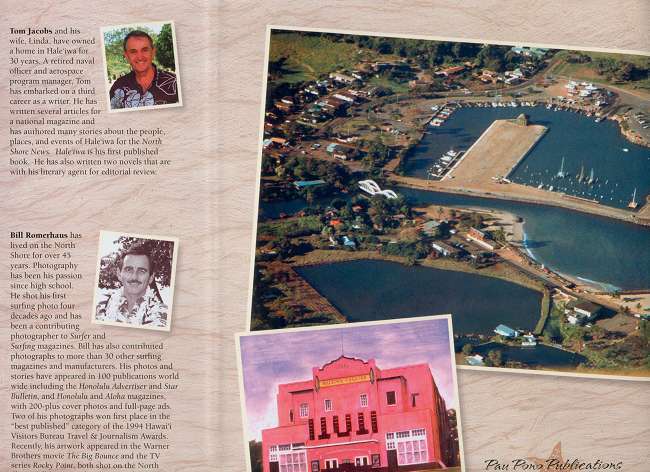 This makes it a wonderful coffee table book for a fond memory to share with others who have lived in or visited Haleiwa, or have dreamed of coming to Hawaii. Retail Price: $17.95, total price is $25.00 each which includes shipping and handling by USPS Priority Mail (takes 3-7+ days) with USPS Delivery Confirmation tracking number. We accept Pay Pal only for credit card payments, (we will send you an e-mail invoice), or you can mail a check or money order (no cash). Foreign orders please inquire about shipping before you order. *** Orders from Hawaii must include 4.1% state retail sales tax - add 75¢ per book to total. To Order Using a Credit Card: (its very simple and secure) just e-mail us at: northshorephoto@hawaii.rr.com, enter 'Haleiwa Book' in the subject line, and then tell us how many books you would like to purchase and we'll send a Pay Pal invoice. They will e-mail you with payment procedure. We will e-mail you with shipping date when payment is confirmed. To Order By Mail: Mail check or money order payable to: North Shore Photogrphy. Make sure you include your mailing and e-mail address. Send to: Haleiwa Book, c/o North Shore Photography, P.O. Box 1239. Haleiwa, HI 96712-1239. Other Shipping Options: We also offer shipment by USPS Media Mail @ $4.50 per book. Please be advised that media mail offers no tracking number, and it takes 4-6+ weeks from Hawaii (it is sent by boat to California). For Multiple purchases we offer shipping discounts or for other shipping options please contact us first.